There are many diets available from which to choose, but one of the most popular, and most effective, is the ketogenic diet. This is not just your average, low carb diet. This is a healthy way of eating, coupled with a very, very low carb diet comprised of nutrient-rich fibrous vegetables combined with plenty of muscle-sparing proteins and nutritious healthy fats. Over the last decade, and even more recently, this type of eating has become a lifestyle for many people, first and foremost for weight loss purposes, but also for the many health benefits such an eating style provides. The ketogenic diet (also called a “keto diet”) has been around for decades and it is touted as helping people manage a host of medical issues, including: excessive weight, uncontrolled blood sugar levels, insulin sensitivity and control, seizures caused by epilepsy, lowering triglycerides and raising HDL levels, reducing blood pressure, and managing diseases of the brain. Such a diet also shows promising results for lowering risks for certain diseases and health issues like diabetes, stroke, heart disease, and even cancer and more. In fact, some of the latest studies show overwhelming evidence of the link between cancer and sugar, so limiting or eliminating sugar from your life, especially through the use of a ketogenic diet, is a huge step in the right direction, health wise. In fact, a ketogenic diet and a low carb lifestyle are now Sweden’s nationally recommended and approved diets. Weight loss was actually not the main goal when researchers first delved into studying a very low carb diet and its effects. Doctors and scientists in the medical field were initially interested in managing health problems through dietary changes. With the finding of all the other wellness advantages, the discovery that a ketogenic diet also boosted weight loss was an incredible realization. Let’s discuss what a ketogenic diet is, and how this diet can help you lose weight and become healthier in the process. It may come as a shock to many, and is certainly a paradigm shift, that you can lose weight, get more energy and get healthy while reducing the chances of disease, all by eating more fat and less carbs. The fear of eating fat has permeated our society for many years and it’s simply a hard concept to get past. However, once you understand that fat, itself, doesn’t make you fat, and that overeating in general (too many calories in versus not enough calories expended) is the culprit, you may be more willing to give a low carb lifestyle a try. The word “ketogenic,” or the state of being in “ketosis,” means that your body has burned all the sugar in your bloodstream from the carbohydrates you’ve eaten, and it is forced to switch from burning carbohydrates for energy to burning fat for fuel. This is a process which takes place in your liver, as your body assimilates and digests its food. In Webster’s Dictionary, the medical definition of ketosis is an increase of ketone bodies in the body in conditions of reduced carbohydrate intake and reduced carbohydrate metabolism. The production of ketones is also a by-product of higher than normal fat metabolism. You know you’re in ketosis because your body is releasing ketones. Less carbohydrates consumed from food means less carbs for energy in your system. This leads to increased fat-burning potential, and thereby weight loss! Obviously, controlling your weight is a benefit, and many people experience very successful weight loss; but also, a lesser known, happy side effect of the keto diet is less hunger and less cravings. Less hunger and cravings will, of course, make your time dieting much more comfortable, but it will also make it easier for you to stick to your diet plan. And, we all know what happens when you stick to your plan – you get great results! So, let’s take a more in-depth look at this tried and true diet, which not only will help you vastly improve your health, but will also have you feeling leaner in no time. 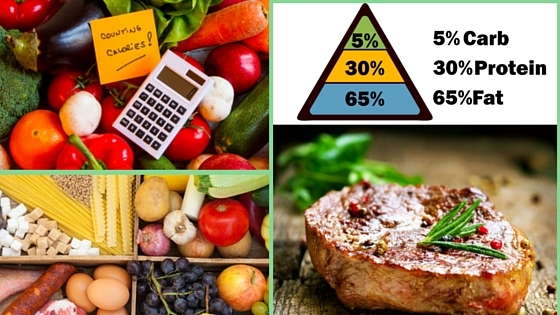 And, if you’d like to learn more about the research behind the use of a ketogenic diet, and the health benefits you can gain from using this diet, there is much more to learn at the Reset Factor Online Program and Community pages. How to Count “Net Carbs"